Heads up Stargate fans, the prop auction starts on the 25th. They’ve got pretty much everything from uniforms to animatronic Asgaard puppets. Always wanted a Zat gun to use on your editor? They’re auctioning one off. Fancy a Stargate: Atlantis PDA? You can pick one of those up too. Propworx is auctioning a ton of props starting this coming Saturday. You can view the catalog online, or download it from the Propworx site. The auction itself is in Washington state, at the Science Fiction Museum of Seattle. 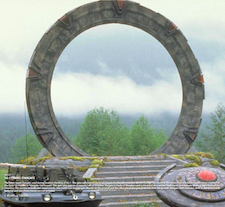 The star of the show (no pun intended) is an actual Stargate, the one they used on location is made of fiberglass and welded steel. The bad news is that the gate is expect to sell for somewhere in the neighborhood of $80,000 to $100,000. We’ve asked Devin to pick one up for the CrunchGear offices, so no one bid against him please. I just want a hard copy of the auction catalog.